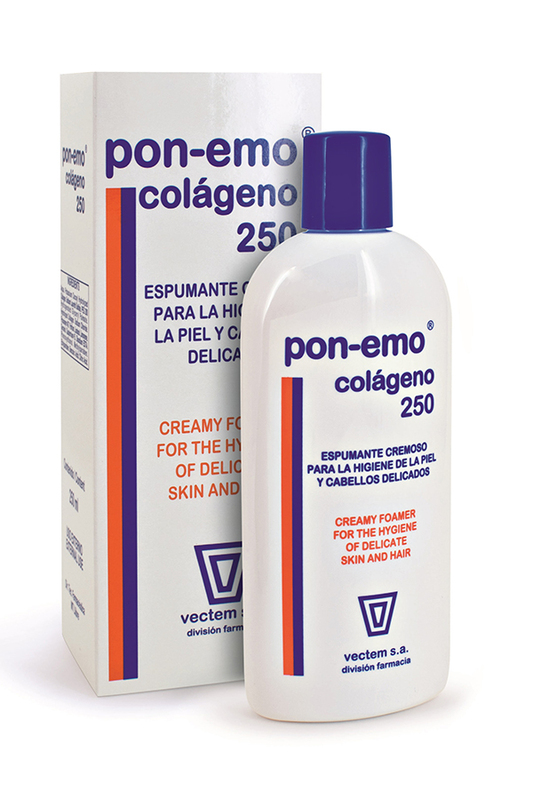 PON-EMO COLÁGENO 250 , vectem s.a.
Dermatological lipoprotein-enriched shampoo and body wash gel. Cleanses and protects delicate, sensitive skin and hair intolerant to conventional shower gels or shampoos. Forms a creamy and highly protective foam with emollient and dispersing properties, suitable for cleansing sensitive, flaky skin and delicate areas. Also indicated for daily cleansing of oily hair. Adds volume to hair. Contains hydrolysed collagen, which gives it even greater skin tolerability. Collagen protein is similar to the nature of our skin. It does not cause the intolerances potentially associated with traditional gels and shampoos. Confers protection, body and bounce to hair.